When dessert turns into breakfast, you know I’ll be a fan! 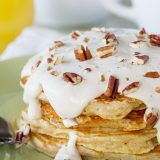 These Carrot Cake Pancakes are full of all of the best carrot cake flavors and topped with a maple cream cheese syrup. In a large bowl, whisk together the flour, sugar, baking powder, pumpkin pie spice, baking soda and salt. In another bowl, combine the eggs, buttermilk, melted butter, and vanilla. Whisk to combine. Stir in the carrots and orange zest. Add the wet ingredients to the dry ingredients, stirring just until mostly combined. Add the pecans and ginger and fold in. Cover the bowl and set in the refrigerator for 30 minutes. Heat the oven to 200ºF. Place the cream cheese in a heat proof bowl and beat until smooth. Add the maple syrup and beat on high until combined and light. Place the bowl in the oven and heat until it is a pourable consistency. Heat a griddle or nonstick saute pan over medium heat. Butter the surface of the griddle. Drop scant 1/4 cupfuls of the batter onto the hot griddle, spreading out with a spatula if needed. Cook until bubbles start to form and burst, about 2 minutes. Flip the pancakes and cook on the second side until cooked and browned, another minute or two. As the pancakes are finished, transfer them to a parchment lined baking sheet and set in the oven to keep warm. To serve, stack the pancakes on a plate and drizzle with the maple cream cheese. Top with chopped pecans. *prep time includes resting time.